Given any break from school I usually take the girls to Bounce Town for some fun. This was our first trip back since Kayla started walking. Last time she was a crawler and loved the feel of crawling across the various blow up toys. I thought for sure she’d love it even more now that she was walking. Uh, I was wrong. 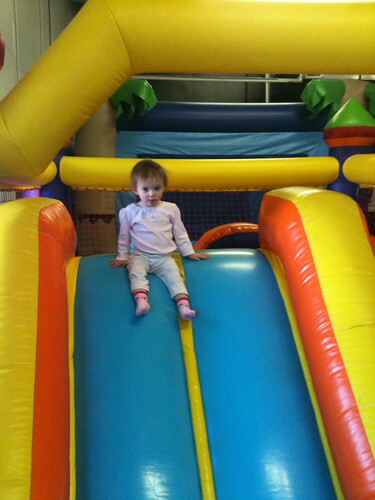 She didn’t like the feel of the bouncy air bouncers and cried whenever I tried to make her play on one. I made her slide a few times but even that was greeted with screams. I would often find her in the back corner sitting happily on this bench away from the action. 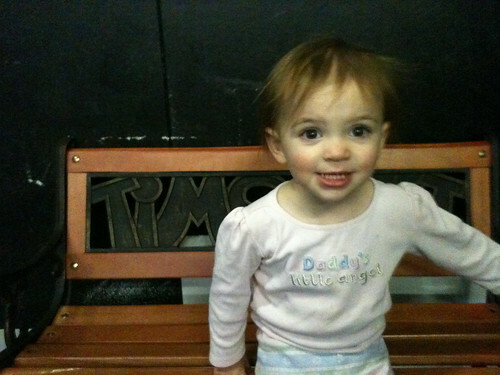 It wasn’t until later that I noticed the wording on the bench said “Timeout.” I found this quite hilarious for some reason. Looks like we’ll need to give this one some more time before we give it another try.